Initially planned for TWO restaurants, the session was subsequently shorten to accomodate a lengthier chat, without the need to rush and gorge/choke on our food. We ventured to Market Street in Penang, an area populated by the Indian community. Hence no prize for guessing what we had for dinner. Karaikudi Restaurant was featured in many, many Penang food blogs sometime ago, when the floggers were invited for a joint-review session. So if the name does ring a bell, you know where to look for the other reviews! 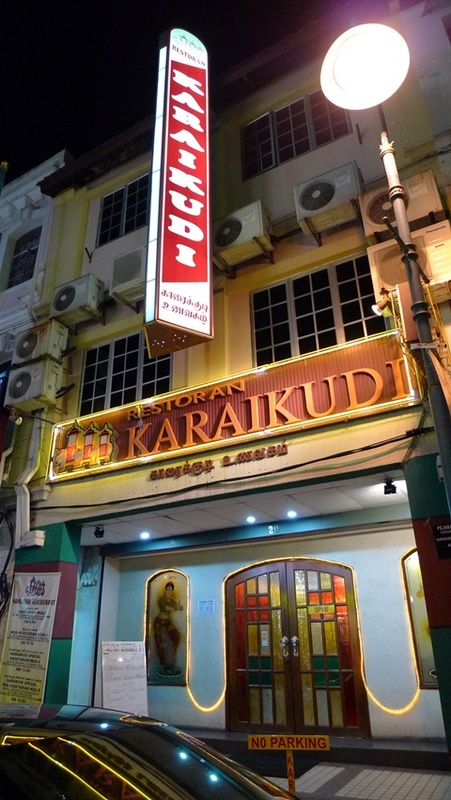 Serving a delectable mixed selection of Northern and Southern Indian cuisines, Karaikudi has two outlets on the island, one being this one on Market Street, while another supposedly ‘higher-ended’ one at Tanjung Bungah, Penang. 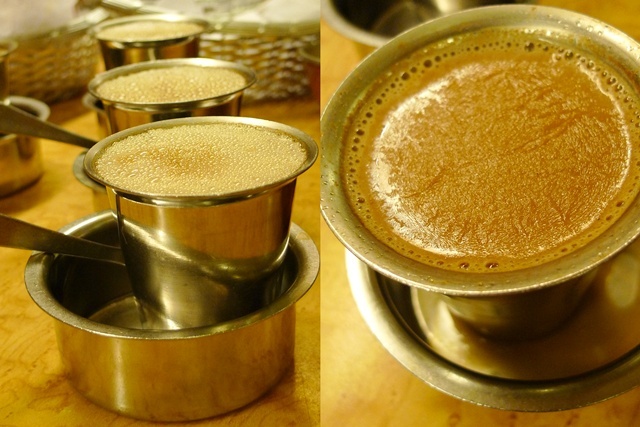 The filter coffee (akin to Madras coffee from Ananda Bahwan) at Karaikudi’s was smooth, but that was all to it. Not milky, creamy nor even strong, the coffee served its purpose as a teaser, at best. Especially to one who’s accustomed to caffeine shots day in and day out, this one was mild enough to be drank sans the sugar. The Chilli Paratha was way out of our expectations. Or possibly mine only. Ken did all the ordering, and we merely did what floggers do best ; Snapping photographs & Eating. The paratha was chopped finely, together with the chillies, tomatoes, onions, etc, then stir-fried with a hint of sour, slightly spicy sauce. And served together with 2 accompanying sauces, one being the classic yoghurt, another was a creamier coconut chutney-like gravy. Mutton masala was intensely flavourful, but lacking in the love-it-or-hate-it gamey taste. Which, may be a blessing in disguise for most. 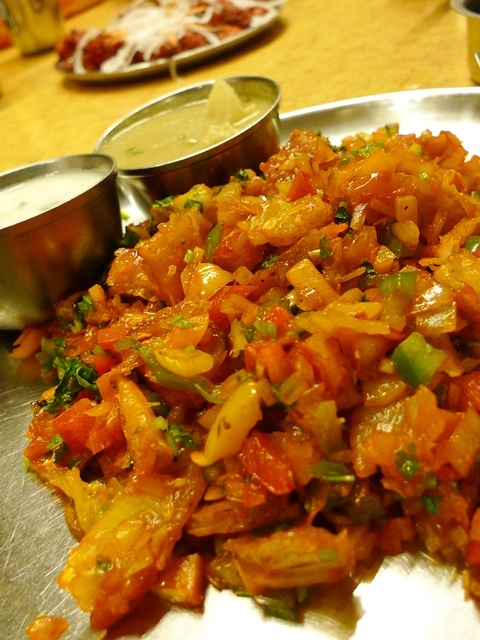 Romali roti is a healthier choice than the usual roti, or even cheese or garlic naan. Rolled up in a spring roll-like manner, the soft, fluffy bread was almost devoid of any flavour, perfect as complement to the stronger tasting curries and condiments. 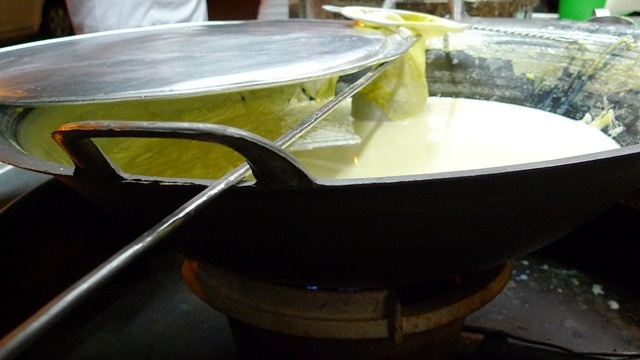 The Thosai was shaped like a cone, typical of mamak-style servings of Roti tisu (Kayu’s towering version comes to mind! ), but at the end of the photo session, the cone sagged a little, and we had to prop the bread up for more shots. As no one likes saggy stuff, right? Tastewise? Not something that’ll jump at you, nor tantalize that tastebud. But the Chicken 65 here is good. Even better than Kalai’s version, with more meat and juice in tact. Served on a metal plate, in bite-sized form and garnished with fresh onions, this dish can be a snack on itself. Location : Karaikudi Restaurant @ 20, Market Street, 10200 Penang. Tel No : 604-263 1345 or 263 1359. Another branch at 1K, Jln Sungai Kelian, Taman Sea View, Tanjung Bungah, Penang. Tel No : 604-899 6466. Opening hours : 11am til 11pm. Other reviews include : Ck Lam, Lingzie, Stevengoh, Penangtuapui, Crizlai, and many more. Pardon me, I’m rushing for time as I’m typing this! Some good old milk to drown the sorrow …. i meant, calm the fire. 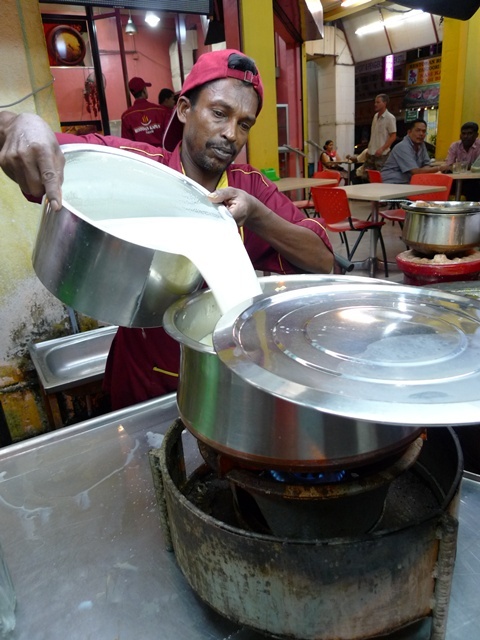 For a taste of traditional milkmen’s REAL cow’s milk (aka Susu Lembu), with extras in the form of additional milo powder, or an egg, or even better, their signature Almond/Badam Milk (Susu Badam) with miniature grapes/raisins, and cashew nuts. CK Lam was the culprit, and now I’m the addict. Being a fresh milk fan, I’m sold at the thought of drinking a wholesome, hearty glass of milk, what’s more with addition of grinded almond (at least I think that’s what it is, with a tinge of yellowish hue), and some bites in the form of raisins, mini grapes (real tiny but sweet ones) and soft cashew nuts. Don’t look down on that unassuming glass of milk. After one glass, you’ll probably wished a bed was provided on the sides, so you can reach slumberland in an instance! Haha, you know what they say bout a cup of warm milk before bed. To those wary of almond tea, almond milk, or any almond-flavoured beverages at all, don’t fret. Unlike the usual almond tea served in Chinese kopitiam, with a heavy scent of erm … cockroach’s droppings (or so they said, not me), the Badam Milk here is thankfully devoid of that annoying, acquired taste. If you lurve your milk, you’ve got to try this! 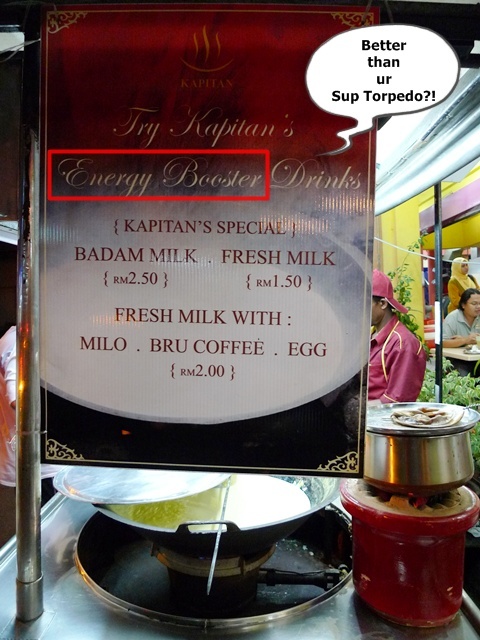 Location : Kapitan Restaurant @ 93, Lebuh Chulia, 10200 Penang. Opens 24 hours per day! Read more from The Star’s blog, StevenGoh, vkeong. Kapitan’s famous for their Tandoori chicken, Naan and Briyani as well. Sapped my energy’s more like it …. slept like a baby thereafter! With that, I’d like to end with gratitudes all around, to CK Lam, Ken and Lingzie for the wonderful tour around Georgetown in few hours. Hahahaha… let there be more gatherings in the near future, ok? Nice ambiance and also the food looks great. Your photography skill had improved, cool. Will go there to try, thanks for the recommendations..
yes yes yes..the milk here is reallyyy good! One full glass and I'm full already! Thanks for taking some of your working time out for this first meeting with me, ken & lingzie. In your next trip to penang, if you feel comfortable to meet more Penang Food Bloggers, I can organize a gathering for all of them to meet up with you. Just let me have the date and I will arrange one. In fact, we are planning the 4th gathering on the 15th August. It would be a good time to get together. How about that? What?? Somehow I missed you both in KL and Penang!! Must meet next time, OK? i can see the scum on the masala tea! shiok! It's good to read about Penang food once in a while after I left it. 🙂 And almond milk? I'm sorry but that SMELL really came to mind! Haha..
Nice deco of the restaurant. And what you said about the almond milk drink served in Chinese restaurants – the cockroach taste, so true but I like it. Haha! Judging from the comments, wow you are everybody's darling, dahling! This one got class and fresh milk! wanna ask some pharmacy housemanship advise from u when I have the chance, when I'm back. hehe. Nice photos!! Steven Goh : thanks for the compliment. sure, no problem! this visit was a bit in a rush, as I'm attending a conference. NKOTB : really? thats so nice of you. i'll make sure to drop by another time in Penang for the 2nd visit ok? Wilson Ng : you're welcomed! Food Paradise : yeah it was! i like my milk , and this one's gotta be one of the better ones! SimpleGirl : briyani I didnt try this visit. but probably will visit again in the future, in case my cravings come again. thenomadGourmand : so full some more! at RM2.50, it's a STEAL! ck lam : sure no problem! we didnt get the chance to eat Blue Reef this time around. i'll be sure to inform in case I'm going again, ok? 550ml jar of faith : yeahloh … you in Pg or KL mostly? iamthewitch : hey, its NOTHING like the usual almond tea, trust me! i dun like the white coloured almond tea commonly served in coffee shops either. Jason : yeah, that's why this came second. hehehe … a few days after KL, and few days before our Ipoh. Sugar Bean : travelling's tiring, but fun and kinda cool as I like moving around a lot. but blogging-wise, if I dun blog, I'll definitely forget most of the details. LFB : they're great. like a circle of family members. 🙂 much like the KL ones too. TUmmythoz : then am I yours? whoops. Phitoy dun kill me! Christy : true, there's always another visit to Pg. where my foodie instinct was born. worldwindowns : yeah … but note they're from DIFFERENT rstaurants ok? Christine : no problem! yeah hor, you're finishing soon. Citygal told me the other day. ask anything you like! i'll be glad to assist. i'm finishing next yr.
Lingzie : nah … talkingbout food felt right at home! so easy to connect, as common passion ma. thanks to YOU guys instead! Living in Penang I have visited most of the restaurants in Market Street. 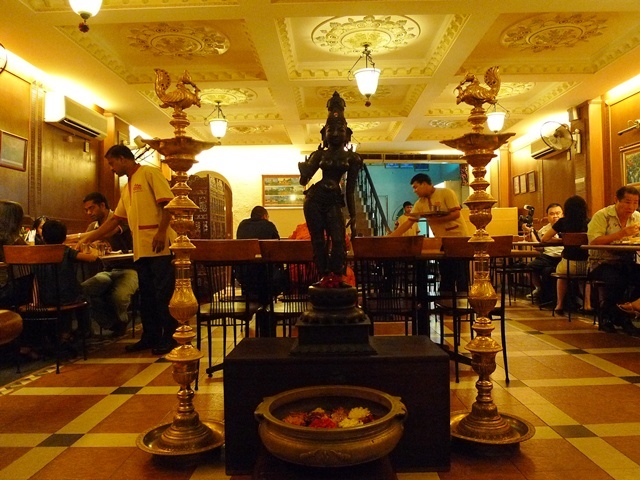 Karaikudi is a tad bit overrated due to one reason – the ambiance. I think the food is so-so and the service is terrible. Try going there as a normal dude during lunch hour, you will find waiters with attitude problems over there. Happened to me too many times. .-= matblogger´s last blog ..So how do you get an iTunes account if you are in Malaysia? =-. i kinda like Kaliamman as well, probably one of the few places that serve nasi briyani on banana leaf?